With the rapid use of smart phones, millions of people around the world now take photos every day. With newer phones capable of greater quality photos, users can take near-professional photos on their phone cameras. Many professionals even take their professional photos on mobile devices. But not every photo is picture-quality and ready to share. So how can you make edits to you photos without exporting them to a PC? Fortunately, most phones offer some built-in editing capabilities, like cropping and auto-tune. And there are dozens of great photo editing apps in the iTunes and Google Play stores. Google has a hidden gem of a photo editor you probably haven't heard about. Acquired during the acquisition of Nik, Google released an update to its Snapseed mobile photo editing software this year. This app should be your main photo editor on your phone. It's easy to learn, easy to use and has great editing features. When you load and edit a photo, you can choose from two main editing toolsets: Tools and Filters. 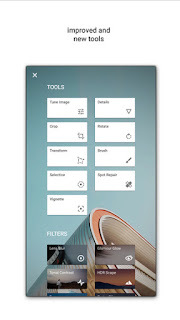 Tools offers several editing choices: Tune, Crop, Transform, Select, Vignette, Details, Rotate, Brush and Spot Repair. Filters includes Lens Blur, Tonal Contrasts, Drama, Grainy Film, Retrolux, Glamorous Glow, HDR Scape, Grunge, Vintage and Noir. Unlike most editing apps, Snapseed puts each edit in its own layer. This allows you to go back and change an edit even if you've made other edits. So you can stack your edits and change each one before you finalize all of your changes on a final photo. My favorite filter for scenic photos is the HDR (High Dynamic Range). Here is a standard photo I took recent of a church in Puerto Vallarta, Parroquia de Nuestra Señora de Guadalupe. Used in conjunction with Google Photos that I've previously shared with you, you can get great photo editing software and photo storage available from your mobile device. You can download Snapseed from the iTunes Store HERE and from Google Play store HERE.